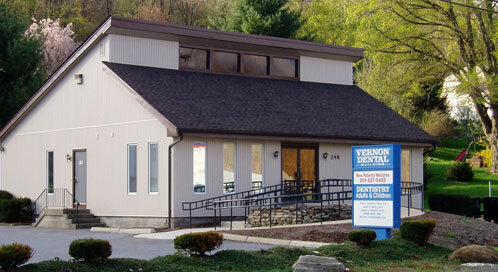 Vernon Dental offers a wide range of dental services including complete examinations, oral hygiene, root canal, extractions and more. We know that any dental office is only as effective and as welcoming as the people who work in it, which is why we take pride in our friendly and well-trained dental staff. Please see our news section for updates on winter closings. Drive safe! We are pleased to welcome you to our dental office and will do our very best to make sure your visits here are as comfortable and pleasant as possible. We are dedicated to providing top quality dental services for your entire family, and pride ourselves on being professional and efficient with your every visit. It is our hope that we can provide you the information that you seek, by answering as many questions as possible in advance, to help make your visits with us go as smoothly as possible. Please feel free to call us with your concerns at any time. We look forward to providing you and your family with the dental excellence that you deserve.